And in the case of Zingerman’s Bakehouse this is certainly true. Early last spring, Bakehouse managing partner, Frank Carollo, received an email that would ulti­mately lead to a new relationship, a new source of Michigan-grown whole wheat, and a brand new variety of bread. The email came from a canola farmer named Bill Koucky (“koos-kee”) in Michigan’s Leelanau Peninsula, just north of Traverse City. Bill is part of a network of farmers in the area who grow non-GMO canola and sunflowers under the umbrella of Grand Traverse Culinary Oils. The farmers carefully cultivate their seeds, then mechanically cold-press them to extract the oil. GTCO uses no chemicals whatsoever, and the canola and sunflower oils are 100% natural. In order to maintain the correct nutritional balance in their fields, the Grand Traverse farmers network rotates their crops (as traditional farmers have been doing for thousands of years). So they grow things like clover, rye, corn, and oats to replenish the nutrients used by the canola and sunflower crops. One of their off-year crops was a sturdy whole wheat that thrived in the colder cli­mate of Michigan’s Northwest. The wheat was good – high-quality, high-protein – perfect for mak­ing bread. It was so good, in fact, that until last year the bakeries in the Leelanau/Traverse City area bought out Bill’s entire wheat crop. In addition, the rise of the craft beer and distillery movement has created a demand for high-quality grains in the state. Bill and his partners established Grand Traverse Culinary Flours, increased their wheat yield, and began seeking out possible customers further south. Which is how he came to send an email to Frank. Fast forward. Bill drove down, dropped off some samples, and took a tour of the Bakehouse. 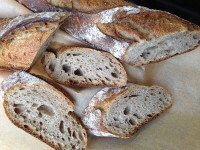 Afterward, baked about a dozen test loaves using the new Leelanau flour, and the results were very promising. So, the Bakehouse crew adjusted the recipe a bit, then baked another dozen loaves. And they repeated the process until they got the recipe just right, tweaking the ingredients, changing the dough-proofing duration, and watching the loaves very closely during their time in the ovens. So was it worth all the time and effort? “The bread was very good,” says Frank with a smile on his face. And the Zingerman’s Bakehouse True North Bread was born. “We started selling the True North Bread at the beginning of March, and we’ve been pleased at how well it’s been received,” Frank says. 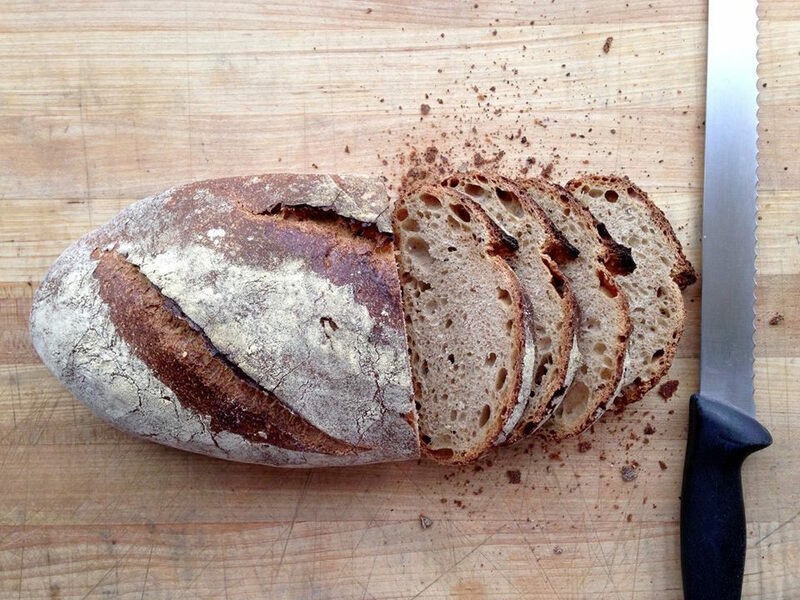 Zingerman’s Bakehouse has been on the hunt for high-quality, locally grown wheat flour for some time, so this new relationship with Bill is timely. The search has been a challenge, as Frank is look­ing for a suitable wheat raised using traditional, sustainable methods. And it hasn’t been easy. For decades, farmers in Michigan have been incentivized by higher market prices to grow low-protein wheat, which produces a softer flour that’s perfect for making cakes and pastries. But to make good bread, a baker needs a flour with a higher protein content (a “hard” flour) to form the gluten that’s necessary to create the loaf’s dense, chewy structure. So, to encourage farmers to grow higher protein wheat, Frank uses his own incentive. He guar­antees a certain return, or price, for the crops in order to offset the risks that come with growing wheat using traditional and sustainable practices. In years when farmers have a successful harvest, it’s likely that other growers in the region are experiencing the same. This translates to a local market that’s enjoying a saturation of goods from these farmers. Unfortunately, this abundance can also drive down the selling price of the for farmers, so the Bakehouse locks in a fair price ahead of time that’s often better than the market price. And this is good for farmers in years of low crop yield as well. With the price guarantee in place, the farmer can be secure in the knowledge that the year will not be a total loss. Up in the Leelanau, Bill Koucky incents the farmers in his network in much the same manner. The other challenge facing a bakery that’s been successful in finding a source for good wheat is finding a place to mill and store the wheat after harvest. In the case of a conventionally grown flour, the major players in the flour market have the facilities to mill and store their wares until they’re ordered and shipped. Smaller growers do not have such facilities at their disposal. So Frank must pick up the cost of first shipping the wheat to a mill, then pay for grinding and storage, and then once again assume the cost of shipping the ground flour to the Bakehouse. This can quickly become prohibitively expensive. Ideally, Frank would like to see a local processing mill and storage facility located a bit closer to the Bakehouse. “A hundred years ago, every town had its own mill, so this wasn’t an issue. You’d simply harvest your grains and drive them to the local mill.” Frank confesses that he’d personally love to learn the art of milling good flour from Michigan-grown grains, and probably would do just that, “If I didn’t have a busy bakehouse to run…” Fortunately, for Frank, Bill Koucky and his partners at Grand Traverse Culinary Flours have got him covered. Bill’s facility features it’s very own stone grinding mill that can be adapted to produce a variety of grades, from coarse to very fine. And Bill has plenty of storage space. Big things are obviously happening in the Northern Michigan world of grain, and Frank is hopeful that they continue to enjoy the success of the past few growing seasons. In the past year, the south­ern end Michigan’s Lower Peninsula saw more rainfall than usual in the early season. The wetter-than-normal environment was unfortunately favorable to certain kinds of crop blight, and a lot of growers farmers saw their season fail as a result. By contrast, the micro-climate in the Northwest region of the state has been much more hospitable to farmers in recent years, and the very good yields seen by Bill and his partners are establishing the area as a potential new source for quality grains. The immediate result of this new connection with our Northern neighbors is a fantastic new bread now available at Zingerman’s Bakehouse. After harvest, Bill sends their red spring wheat through the stone grinding mill to produce a flour that contains more wheat germ and bran. This wheat flour, in turn, produces a bread with great natural flavor and texture. And in the end, that’s what is most important.